Sensing relative humidity above 95%, before now, has been just about impossible. SCS is proud to introduce the latest advancement for high humidity applications. The WD100 is the first electronic true wet bulb/dry bulb to feed true RH values to a central PLC. When coupled with the GCS 6000 sampling system, customers can see the true RH in a space in real time. Control can be accomplished to humidify or dehumidify. The convenient bottle holding distilled water is easily refillable to offer water to wick up to an accurate sensor. Comparative readings are simultaneously evaluated and the RH is calculated and displayed on the 6000 screen. 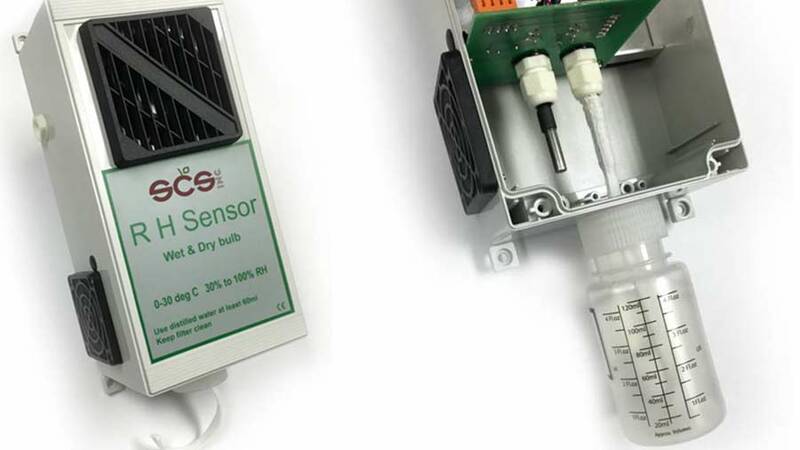 These readings from either a single or multiple sensors throughout the room can be integrated into the GCS6000 for real-time, multi-point room conditions, data logging, and remote/automatic triggering of required measures for carefree maintenance.